Although most people picture alfresco living when they think of the domestic lives of Angelenos, the most quintessential experiences are often hidden just behind the front door. Due to LA’s thriving collection of world-class interior designers, it is the indoor spaces that have become the palettes of the most creative designers in the business. With the Pacific Design Center and burgeoning La Cienega Design Quarter within blocks of one another – and playing host to a full stack of LA-based interior masterminds – the interior design scene in Los Angeles stands out as one of the best in the world. Because of this unique confluence of prominent designers, we explored the Top 21 high-end design firms in the City of Angels. Although we focused on top tastemakers in the residential category, we learned that many of the LA residential design elite also collaborate on captivating boutique hotels, restaurants, and product lines. We looked for firms who have an original voice and who regularly work on high-profile, one-of-a-kind projects. We also considered the wild-card – we looked for budding designers with promising portfolios or interesting contributions to the field. Not in the market for a million dollar interior makeover? Many of the products and designs created by the following designers have inspired hundreds of Pinterest-worthy trends, Instagram feeds, and entire product lines of affordable, stylish furnishings that you have the benefit of learning from before approaching your own design project. With iconic clients including Stephen Spielberg and Dustin Hoffman, Molly Isaksen creates calm, harmonious interiors to suit her Hollywood-royalty clientele. Adept in bridging the gap between sophisticated and livable, Molly has worked on projects across a spectrum of client tastes and budgets. The common thread that connects her designs is the polished, elegant, and liveable space she creates for each of her clients. Founded by interior designer Chad McPhail only four years ago, the eponymous design firm has quickly risen in recognition as a high-end residential and commercial design firm for creative-industry clients. Chad adeptly creates one-of-a-kind environments that appear as if they were born from a collection of stylish artifacts that have been in the family for years. By incorporating a love of historical narrative and contemporary craft, Chad weaves together bespoke, personal, and layered interiors that reflect and elevate the lives of the occupants. Chad splits his time between Brooklyn and LA and recently worked on Westlake’s Park Plaza and Refinery 29’s NY office spaces in addition to residential projects for notable Angelenos. Founded by Ryan Brown, Brown Design Group is a high-end residential and interior design firm with offices in both Los Angeles and Santa Barbara. According to the website, the firm designs stylish, organic, and contemporary spaces by combining modern and rustic elements with clean, architectural lines. They have worked on high-profile commercial projects including the NBC Universal offices, the Museum of Broken Relationships, and Q Restaurant in Downtown LA. Ryan Brown is another designer with roots in the entertainment industry – he appeared in Bravo’s design show “Flipping Out” during its early seasons. Founded by Amber Lewis, Amber Interiors is known for their laid back, Cali-casual style that artfully layers bold, colorful textiles with neutral, bright spaces. Amber Interiors is a unique addition to this list because of the firm’s adept uptake of Instagram and Pinterest platforms to share their creations. If you frequent the design blogosphere, chances are you’ve come across her light, airy homes filled with bright pops of colors, often in the form of funky pillows. In addition to managing her well-trafficked social media platforms, Amber runs her design firm and ‘Shoppe’ in old town Calabasas. Amber Interiors is also unique in their design offerings- the firm utilizes digital resources to sell e-decor packages online in addition to full-service, in-person designs. Tamara Kaye-Honey, the head designer at boutique design studio House of Honey, has a knack for designing spaces that artfully and whimsically tell a story. Whether specializing in residential or commercial projects, Tamara and her team weave together art, design, and a knowledge of cultural influences to create spaces that are “fresh and unexpected while remaining invitingly liveable.” In her Pasadena and Montecito-based showrooms, House of Honey features original products, vintage rarities, and designer favorites ranging from Heath tiles to accessories from Tom Dixon. Her design work, including the well-reviewed Otium Restaurant next to The Broad, has been featured in dozens of design publications. Mother-son duo Kathleen and Tommy Clements of Clements Design are known for their light-filled, gallery-like residential spaces that have attracted a celebrity following including Jennifer Aniston, Ellen DeGeneres, and Justin Theroux. The team operates as editors of the spaces they design. By incorporating rustic and sculptural pieces while maintaining clean, bright lines, the team distills the innate and subtly sophisticated beauty present within the architecture, setting, and furnishings they incorporate. Their projects are frequently featured in prominent design publications including Elle Decor and Architectural Digest. As evidenced by his broad portfolio of residential projects, Jeffrey Alan Marks is an adept designer who can seamlessly transition between a range of styles and geographies – from a modern Californian villa to an East Coast beach-side bungalow to a London townhouse. Jeffrey’s designs have been described as fresh, spirited, and timeless, and expertly combine classical, subdued elements with contemporary, edgy accents. Beyond working as an interior designer for well-heeled clients, Jeffrey has published design books, starred on Bravo’s ‘Million Dollar Decorators,’ collaborated on commercial spaces including the Tavern Restaurant in Brentwood, and designed fabric and bedding products. Molly Luetkemeyer is not afraid of color, and her bold-yet-sophisticated interiors demonstrate her willingness to incorporate hues that few other designers dare to. With a self-described aesthetic that is “fresh, expressive, and sophisticated,” Molly injects a colorful, contemporary Bohemian style into her projects and attracts clients ranging from Hollywood A-listers to “stylish people of all walks of life.” Though based in LA, Molly has worked on projects from Bel Air to Martha’s Vineyard. Santa Monica-based interior designer Tim Clarke is best known for his laid-back and casually elegant beachside projects. His breezy and inviting residential spaces epitomize the genre of contemporary SoCal coastal and have attracted such A-list clientele as Sally Field, Matthew Perry, and Portia de Rossi. If a full redesign by Tim doesn’t fit your budget, his Santa Monica shop ‘Tower 20’ is open to the public. There, one can peruse his collection of furnishings, ceramics, and art that will infuse any space with that ‘perfect beach house’ vibe that Tim Clarke expertly wields in his projects. According to Houzz, Tim has also worked on restaurants and hotels as far as Washington state and Hawaii. With the well-deserved title of “modern-day alchemist” bestowed by the bloggers at Remodelista, Jane Hallworth combines moody, refined, sophisticated, and organic elements to create interiors that expertly range from sweet to sinister depending on the project – and the lighting involved. Having designed for a coterie of well-heeled – though undisclosed – clients around LA (rumored to include Ellen DeGeneres and Kirsten Dunst), Jane’s success demonstrates that even the shining stars of LA may need a dimmed and dastardly oasis to retreat to. Jane also runs an eponymous shop – Hallworth Design – located in an alleyway in the La Cienega Design Quarter. Perhaps due to his London-bred sensibilities, L.A.-based Paul Fortune creates subtle and timeless interiors that elude the certainty of a single era or style. Having designed residential spaces for the likes of fashion designer Marc Jacobs, screenwriter Sofia Coppola, and Fun! frontman Nate Ruess, Fortune has made a name for himself over the past 30 years as the master of impeccably considered interiors. In 2006, he also helped rework the designs of the Sunset Tower Hotel to restore it as an iconic destination. As exemplified across his portfolio and wide press coverage – with features in Vogue, W, and Vanity Fair, amongst others – Fortune is known for his deference to historically-proven furnishings and concepts while still incorporating intriguing allusions to modernity. Though now based in Ojai and working as more of a design advisor, he maintains his involvement in select projects. Jeff Andrews has arguably created the most viewed interiors in all of LA due to his role as designer-on-call to the homes of the Kardashian Clan. 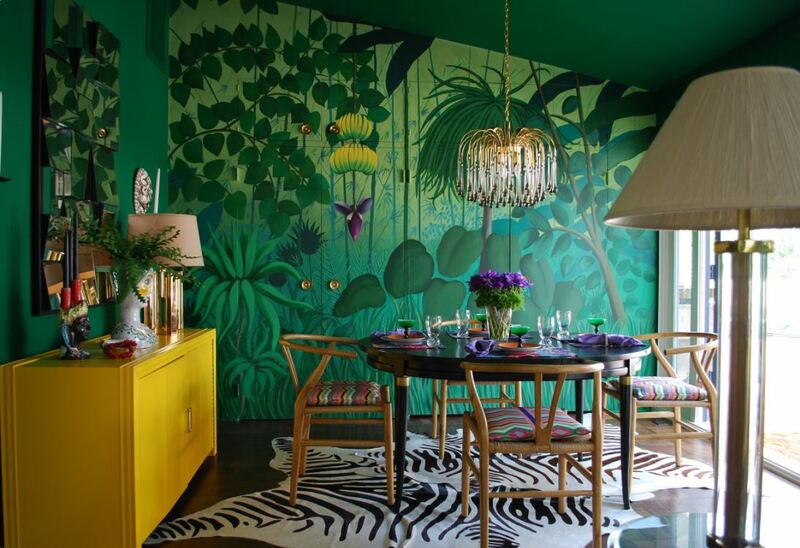 He has also designed interiors for Ryan Seacrest, Michael Hall, American Ferrera, and Kaley Cuoco, and is known for pushing the boundaries by using bold concepts and colors while keeping his designs classically rooted, warm, and sophisticated. Jeff has also collaborated with Mansour Modern, Astek Wallcoverings, Jamie Beckwith Collection, and A. Rudin to create products that reflect his bold and distinctive style. His work has been featured in dozens of publications including Elle Decor and Vogue Living. With designs described as “sophisticated, casual, vibrant and daring within a classical structure,” Peter’s creations are a nod to both his European roots and his experiences in NYC and LA as an interior and textile designer. His work blends vibrant color palettes and textiles – from his eponymous textile company -, bespoke furnishings, and vintage and modern elements to create a uniquely bold-yet-refined style that the Wall Street Journal describes as “Merchant Ivory Moderne.” Peter and his team restore and design the interiors of landmark houses or custom built homes for clients including Minnie Driver, Jennifer Garner, and Steve Tisch. In addition to his interiors and textile companies, Peter is also the man behind Hollywood at Home, a well-patronized design shop located in the LA Design District. Matt Black Inc. founder Cliff Fong created a name for himself as a prominent interior designer through a fortuitous encounter house-sitting and touching up the home of his friend Ellen DeGeneres. In just a few years, this and similar experiences grew into Cliff’s design firm “Matt Blacke, Inc.,” and led him to take on projects for the likes of James Franco, Ryan Murphy, and Balthazar Getty. Cliff is known for his beautifully curated spaces that feature vintage treasures, subtle architectural details, and collected pieces of fine art. His designs are both interesting and sophisticated, and they keep Ellen DeGeneres coming back for more (according to an interview with Departures, they’ve done 20 homes together). Additionally, Cliff has worked on commercial spaces including the former Ink Restaurant and Twelfth Street shop. He also co-owns Galerie Half, a purveyor of stunning 20th century furnishings and artifacts. Amy Kehoe and Todd Nickey – the two halves of the whole “Nicky Kehoe” – are recognized for their charming, warm, and liveable residential and commercial interior designs. As avid flea market patrons and international travelers, Amy and Todd thoughtfully collect vintage finds from around the world to display in their atelier and incorporate into their projects. Self-described as having an aesthetic “heavy on aspiration and an overall blend of feminine and modern,” the designers rely on juxtaposition to layer materials as well as bespoke and antique furnishings to create utterly unique spaces. Having designed for clients such as Ginnifer Goodwin and Mark Ruffalo, they certainly have attracted a following to their collected yet comfortable interiors. About Jamie Bush and Co. Though trained as an architect, Jamie Bush now operates a full-service interior design firm that expertly blends modern design with warm, organic, and inviting elements in a juxtaposition he calls “raw and refined.” He has a knack for designing spaces that defy a single era by layering modern, contemporary pieces with period furnishings in unexpectedly rich ways. Having been featured in more than 40 publications, Jamie’s subtle reinterpretation of California design garners a steady stream of public attention. Beyond architecture and design, Jamie is also a talented painter, hailing from a long lineage of artists, whose pieces have been used as the inspiration for rugs in partnership with Marc Phillips. He even worked for a year-long stint at the offices of Kelly Wearstler, number one on our list. Select distinctions include AIA awards and being a member of the Tulane School of Architecture Board of Advisors in 2017. To say Joan Behnke knows what the über-rich like in their homes would be an understatement – she decides what goes in their homes. In working on residential projects for clients ranging from Tom Brady and Giselle to tech-mogul Alec Gores, Joan has been called the “Billionaire Whisperer.” According to an earlier Forbes article, Joan specializes in bringing her clients, or ‘collaborators’, along for the journey of the design process. Behind every piece of six-figure furniture, bespoke finish, or antique art that will end up in their home, Behnke connects her clients to the story and narrative behind the products. While her style has evolved over time and covered many genres, her interiors appear to share a common thread of contemporary elegance with rich classical allusions. With accolades in the realms of residential and hotel design, fashion, furniture design, home accessories, and ‘objets d’art,’ it is hard to pin down only a few reasons why Kelly Wearstler earns the number one spot on our list and deserves her title as the “presiding Grand Dame of West Coast interior design.” Kelly has lent her signature contemporary and sophisticated design services to such tastemakers as Gwen Stefani, Cameron Diaz, Ben Stiller, and Stacey Snider. Her work on the Avalon Hotel in Beverly Hills and the Viceroy in multiple locations redefined both the hotels’ identities and cemented her status as an internationally renowned and utterly distinctive hotel designer, a status which she now applies to her work on the Proper Hotel collection devised by she and her husband, developer Brad Korzen. Recently, she has also collaborated on multiple design projects from Lee Joffa wall coverings to Compartes chocolates. If you stop by her eponymous Melrose showroom, you can find a curated collection of new and antique products and furniture or pick up one of her four books on interior design. Some would say she wrote the book on the subject. Selected awards include Elle Decor A-List, Arch Digest AD 100, and Wallpaper* Top 20 Interior Designers.